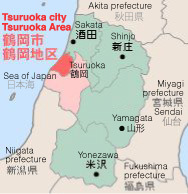 The town that was used as the setting of the movie "The Twilight Samurai"
One of the former Four Guardians of the Tokugawa Sakai Tadatsugu's grandson Tadakatsu came to Tsuruoka and managed the castle. It was the location of the only Han school in Tohoku. It is known to be jostling with traditional festivals, cultural assets and historic landmarks such as the white walled western style houses from the Meiji-Taisho era. It is the hometown of the Naoki Prize writer, Shuhei Fujisawa that he loved deeply. ・The former Kazama residence "Heishindo"
・Dewa Shonai international forum "Amazon Folk Museum"